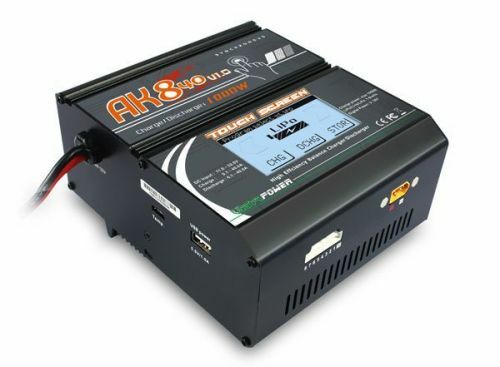 This 1350 watt DC charger is a must if you fly or use large batteries. Thanks to its touch screen interface, it is very easy to use even for those not familiar with battery charging. Microprocessor controlled: 32 bit MCU controlled. This charger is equipped with a mini USB port for updating your charger with new functionalities as they are added. You can offer power to other charger with digital power function. AC Input voltage 110-220V DC output Voltage 12-24V Output power max.1200W Output current max.60A Interface - Strong and durable alloy case, Equipped with a convenient to use bottom support base. Output - Three sets of output, in addition to dual output external lines, it is equipped with an EC 3 output port. Cooling fans - It is equipped with three cooling fans which can control the temperature of the product. Features–High quality suffix port, manual toggle switch and screen display for easy viewing.